The TM-2 is an affordable addition to your kit, and could well divert the sample-hungry hybrid drummer's attention from shelling out on an SPD-SX. Nice one, Roland! Very well thought-out piece of kit. Refreshing to see a company react to what players actually want. We'd like to have seen a click generator on board the TM-2, plus a little more accessibility from the controls, and editing would be nice. 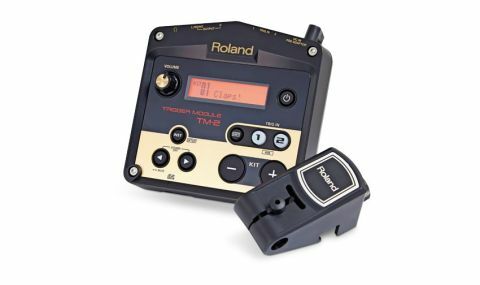 If you're still in any doubt about a hybrid setup - or the outlay seems too high - direct your attention to Roland's new TM-2 trigger module, a portable device that aims to solve many of the off-putting problems of 'going hybrid'. We were sent the very first TM-2 to hit the UK, along with a set of RT-10 kick and snare triggers to get us going. This little box works very similarly to the brain from most electronic kits. It comes loaded with sounds (162 of 'em), an on-board effects processor (11 effects) and features two dual-trigger inputs. On the back, you'll also find a pair of outputs to send your sound to a PA (1⁄4" jacks), plus a headphone output (mini-jack), and on the side of the unit is a pair of MIDI ports (in and out), in case you want to incorporate any other sound sources. The TM-2 runs off a mains power supply, or four AA batteries for greater portability. So far, so TD-4, then. But there's one thing that sets this apart from your average drum brain - the ability to load your own samples from an SD card, map them to a pad and play them as part of your kit. It's a big feature in our opinion, and one that has made Roland's brilliant (but pricey) SPD-SX modules such a hit. "Setting up the TM-2 is easy. The module can mount to a stand with the included plate and a multi-clamp"
Setting up the TM-2 is easy. The module can mount to a stand with the included plate and a multi-clamp, and if you're capable of plugging in a jack cable, you won't need the manual to start getting some sound out of it. As mentioned above, each trigger input accepts two signals, so, if you have a multi-zone pad, you can assign one sound to the head and one to the rim and still get another two sounds out of the other input. There are various presets for Roland triggers and pads - we used the supplied RT-10 kick and snare triggers, and you can use other brands too. There's always a danger of electronic sounds sounding over-processed and dated, but as we noted in our Handsonic review recently, Roland has produced some very decent contemporary electronic and acoustic samples. Exploring kits is foolproof thanks to the large 'plus' and 'minus' buttons, but editing the sounds is made fiddly by the small screen and dual-purpose buttons. There are quite a few menus to scroll through, but if you want a small unit, something has to give. Roland has also usefully included a set of 'element' samples. These are artifacts of sounds that can be used to enhance a sound when triggering. For example, if you're happy with your miked acoustic kick sound, but you want a little more click, you can use a clicky element to add the extra attack blip, without changing your fundamental tone or tuning. The same goes for adding ring to snare drums, and loads more. The real jewel in the TM-2's crown though is the sample playback. Now, we're not suggesting that you break international copyright law, but to test it out, we chopped up a classic drum break in Logic, then exported the individual hits to our SD card. From here, it's simple to assign them to pads and re-play the beat live. You can also sample a phrase and choose to trigger it as a loop. It's a somewhat liberating feature, once you realise that any sound you can record can be incorporated into your live set-up. No wonder keyboard players are known for being so excitable.